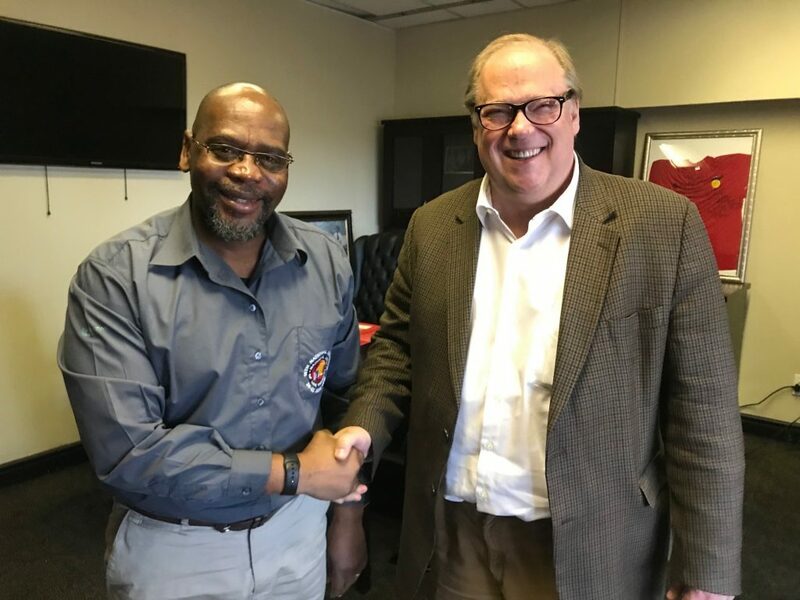 FairPlay has welcomed the South African government’s planned stimulus package which focuses on job creation and includes job protection measures such as trade support for local industries affected by import surges (otherwise known as dumping). The sugar industry is a significant contributor to the South African economy and is a major employer in sugargrowing areas like KwaZulu-Natal and Mpumalanga. But the South African sugar industry is under threat. A vital, strategic and labour-intensive South African industry that should be expanding and creating more jobs is instead shrinking and putting people out of work. “Crocodile trade such as dumped imports have cost thousands of jobs in the sugar and chicken industries and we have been calling for trade protectionagainst dumping for some time,” said Francois Baird, founder of FairPlay, which fights for jobs and economic growth against unfair trade practices. Baird said it is vital that government acts speedily to prevent further job losses. “I hope this very welcome statement by President Ramaphosa means that government will stop dragging its heels on this issue,” Baird said. The sugar industry has been suffering because of a surge in dumped imports facilitated by tariff protection measures that have been slow and ineffective. industry diversification into areas such as ethanol from sugarcane is a missed opportunity that could re-vitalize the industry and create tens of thousands of new jobs. In his letter to president Ramaphosa Baird stated “An ethanol mix in our petrol would reduce our oil purchases while creating jobs in a new ethanol industry and in an expanded sugar industry. Investment incentives for local ethanol need urgent attention. Additionally, ethanol from sugarcane would be a great resource for the development of a bioplastics industry. FairPlay also maintains that proper tariff protection, would revitalise both the sugar and chicken industries. The resultant agricultural and agribusiness expansion would spur economic growth in poverty-stricken rural areas, where jobs have been lost and communities are suffering because of dumped imports. FairPlay founder Francois Baird participating in SAFDA’s march to save the sugar industry. Trade & Industry minister Rob Davies has approved an increase on import duties to US $680 per tonne. But this is much lower than the US $856 per tonne the South African Sugar Association (SASA) had requested from the International Trade Administration Commission (ITAC) in February. 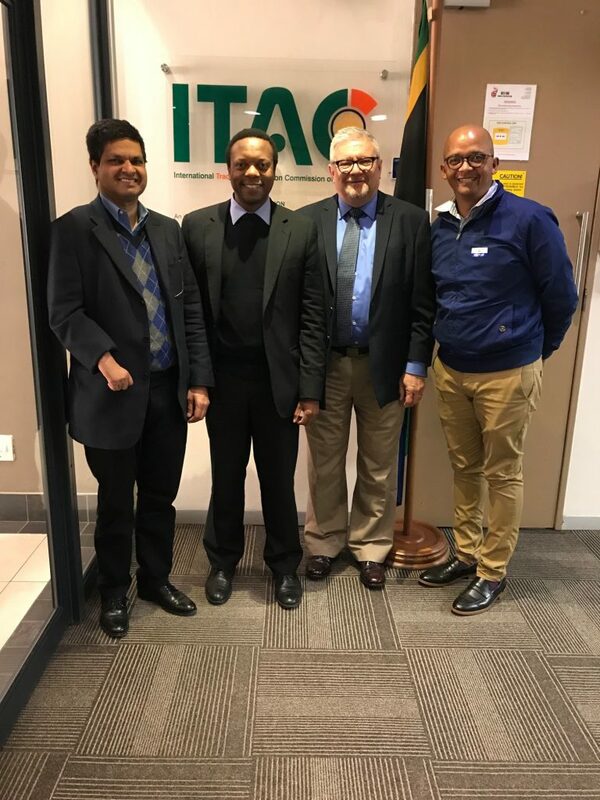 SASA requested ITAC to investigate an increase in import duties in the light of a flood of sugar imports mainly from Brazil, the United Arab Emirates and Swaziland. The association argued that the current duty provided inadequate protection as it was below cost of production. The impact of the health promotion levy, known as the sugarsweetened beverage tax, also had to be considered. 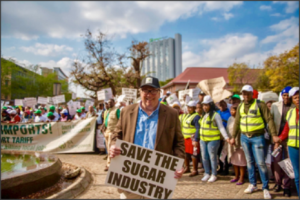 Davies noted that the sugar industry was a significant contributor to the SA economy and was a major employer in sugar-growing areas such as KwaZulu-Natal and Mpumalanga. Sugar production contributes about ZAR14 billion to GDP and the industry employs 85,000 people directly and a further 350,000 indirectly. Davies said a sugar value-chain task team comprising representatives of the beverage industry, retailers, SASA officials, small-scale farmers and manufacturers and officials from the Industrial Development Corporation had been formed in May to identify ways of supporting the industry while keeping prices for consumers affordable. Medium-to long-term initiatives would include a programme to improve competitiveness, diversification, deepen transformation and amend the Sugar Act and sugar agreement. FairPlay maintains that sugar industry diversification, most notably through biofuels and bioplastics is essential not only to save sugar industry jobs but to create new jobs in rural areas. The blending of fuel with ethanol is mandated in over sixty countries around the world. In 2007 the South African Government’s Biofuels Task Team published the Biofuels Industrial Strategy (BIS). The Task Team included officials from the Departments of Agriculture, Environment, Energy, Science and Technology and Finance. The Biofuels Industrial Strategy reflected the Task Team’s conclusion that biofuel development was a viable option to address the country’s energy needs. But perhaps more importantly the biofuels industrial strategy was recognized as a means of achieving the country’s developmental goals through job creation in rural areas. In 2009 the Director of the South Africa Renewable Energy Department indicated that South Africa could create a mandatory market to encourage investment. This is in line with mandatory ethanol blending in over 60 countries. In 2011 the sugar industry warned that unless government policies change to allow sugar production to diversify into energy production, the industry is likely to contract and noted that the industry is expanding in Zambia, Malawi and Tanzania, in response to government-proposed fuel-blending requirements. In 2012 the Southern Africa Bioenergy Association president stated that South Africa is lagging behind countries like Swaziland and Malawi. Malawi’s bioethanol blending is at 15%. In October 2015, the government’s own deadline for blending regulations came and went with no meaningful regulatory framework in place while biofuels development thrives in other parts of Africa. Tongaat Hulett has been producing fuel-grade ethanol in Zimbabwe for blending in the local market for the last few years. During the 2016/17 season it produced 21 million litres of which 5 million litres was supplied to industrial users, while the remaining 16 million litres was used for fuel blending. Brazil and other major sugar producing countries have successfully diversified their sugar industries into bioplastics and biofuels from sugarcane ethanol. It is time for South Africa to follow the same path. Under WTO rules a member country may take a “safeguard” action (i.e., restrict imports of a product temporarily) to protect a specific domestic industry from an increase in imports of any product which is causing, or which is threatening to cause, serious injury to the industry. Late in 2016 China launched an investigation into whether imported sugar caused damage to its domestic industry and to determine the extent of this damage. China’s investigation concluded that its sugar industry had suffered serious damage due to increased volumes of imported sugar and that a safeguard measure would be implemented to protect its domestic sugar industry. Initially China applied a duty of 50 percent on sugar imports but in August of 2018 the duty was increased to 95 percent and applied to major supplying countries: Brazil, Thailand, Australia and South Korea. Similarly in February of 2018 the government of India doubled the duty on cheap imported sugar to 100 percent. India and China are partners with Brazil in the BRICS group of countries that also includes Russia and South Africa. On August 14, FairPlay joined with The Farm and Allied Workers Union in a march to the South African Treasury. Marchers called attention to the lack of government action on protective tariffs and on industry diversification into biofuels. 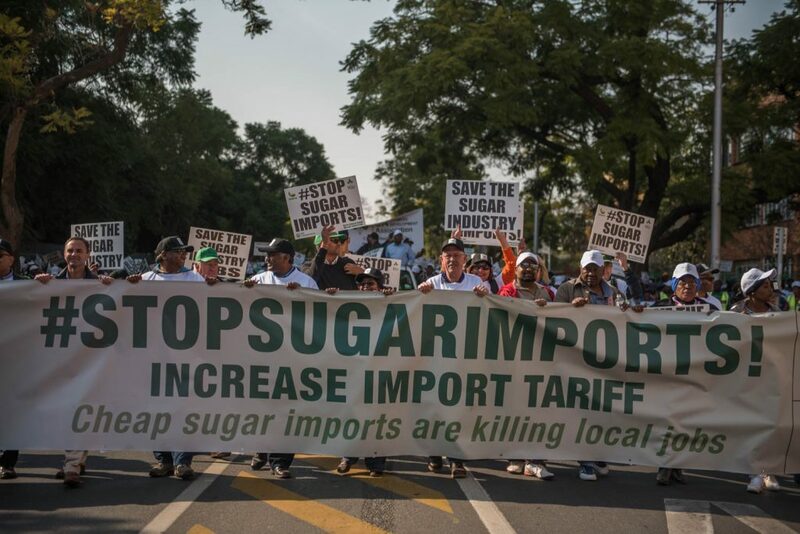 During the march Coca Cola Beverages South Africa was also called out for importing foreign sugar at the expense of South African sugar workers and growers. The FairPlay Movement is a not-for-profit trade movement that fights for jobs. Its goal is to end predatory trade practices between countries so that big and small nations play by the same rules. It supports the principle that penalties for transgressing those rules apply equally to everybody. FairPlay was founded in October 2016. In alliance with existing organisations and experts it formulates and promotes strategies to defend communities made vulnerable by predatory trade practices and promote sustainable livelihoods. These alliance partners are international, currently from the USA, Canada, UK, Ghana and South Africa.